Time for another Omani Product Spotlight! 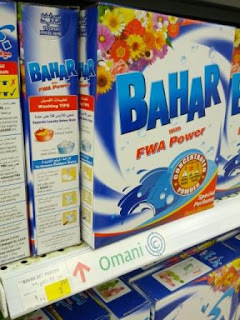 This one is made locally right here in Muscat: Bahar washing detergent. Bahar is a brand owned by the National Detergent Company, which, surprise surprise, is an Omzest (Omar Zawawi) company. It really is true that 90% of the businesses in Oman are controlled by 5 or 6 powerful families. I spent my first 4 years in Oman living in North Ghubra right next to the Bahar factory at the end of 18th November Street, just before Wizarat. Many times I would come home from work in the evening, or be out walking with Mrs Sythe, and we'd smell the freshly-washed smell of Bahar as we walked around the neighbourhood. It is a nice smell and a perk of living there (the draw back being the very loud desalination and power plant next to it!). Bahar currently costs RO 1.240 in Carrefour and does a great job getting our laundry clean. Maybe it does a great job if you don't have any kids. But if you have a bunch of boys that come home dirty and filthy, forget it, it won't do the job and you will either have to send them around in stained clothing, or keep buying them new clothing. I did the laundry all on my own for 3 weeks, and I used it every time. It worked great for me when using a long cycle to wash clothes. I'm a MAN and I do it the MAN'S way.. Take a bar of soap, nivea or lux, chop in half and throw it in the machine drum with your stank azz clothes..